Again, this one stands up too, as if it has legs. I believe it is around 10" square. Itty Bitty is right! 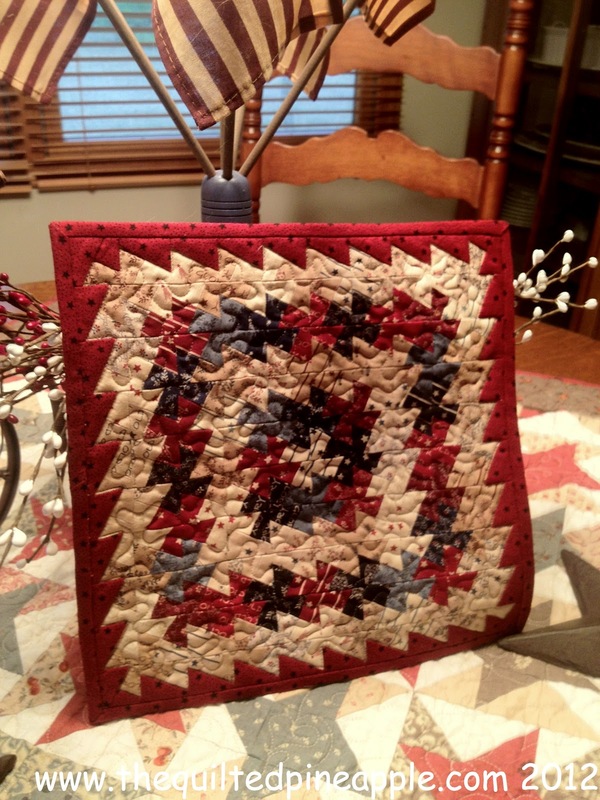 This is a super cool little quilt to make!! It is so fun to see the transformation because it started out looking like this. I really didn't want to cut it up. I loved it just like this!! 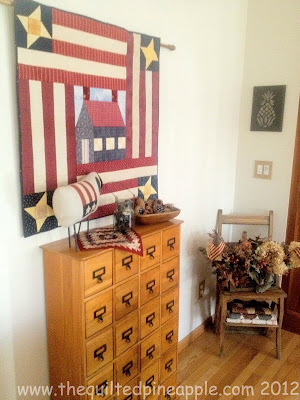 I used 3 Candy packs of Old Glory (my new favorite fabric) and a little yardage from Seasonal Little Gatherings, both from Primitive Gatherings for Moda. I have plenty of little squares left over for something else. :-) After using the Itty Bitty Primitive Pinwheel Template, the design comes together easily, like butter. :-) The pattern/fabric layout is included with the template here. It is amazing! 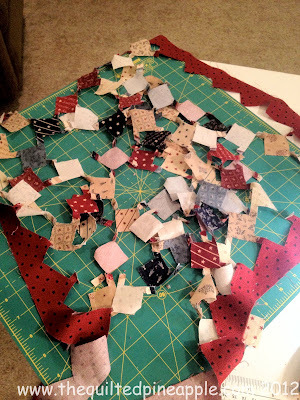 Could even stand up on its own before quilting! LOL! 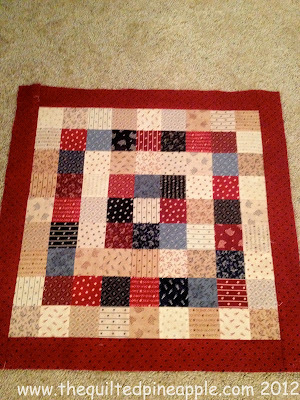 I also quilted this on my longarm. It was quite the sight too!! LOL!! It took all of 5 minutes. A little stitch in the ditch and meandering. Batting is Hobbs 80/20. Pattern called for a single fold binding, which I DID do. I never use binding clips, but they were incredibly helpful in this case! Until I have a few more minis completed (for my wall of smalls), I will decorate with them. 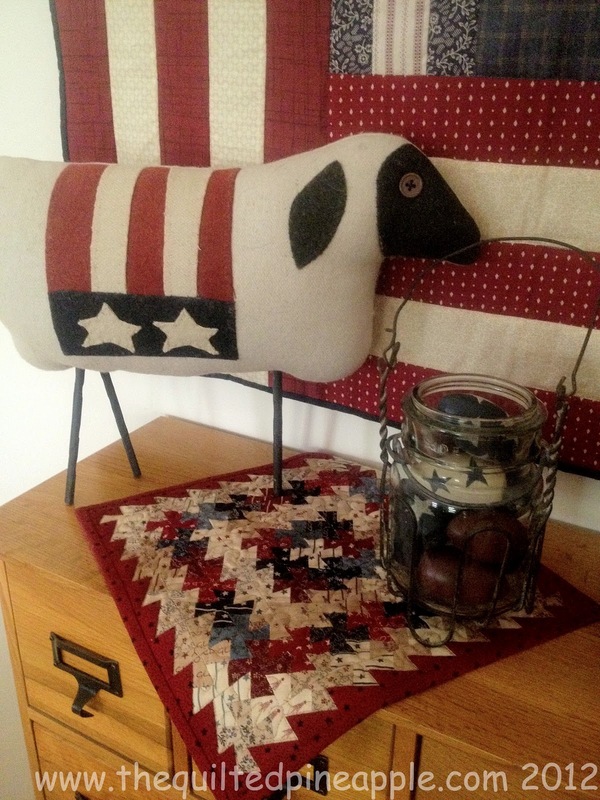 Fits in with all my patriotic decor! The heart bowl fillers are another wonderful creation from Denise of KKL Primitives. She is so creative!! I went hunting for treasures again in my stash (basement storage) and came up with this antique library chair. It is one of those chairs that flips over and becomes a ladder. Another treasure from my grandma. It used to have green paint. Scott started refinishing it years ago, but never finished. I am so glad too. I love how it looks now!! Primitive and worn. Perfect!! I just cleaned it up. 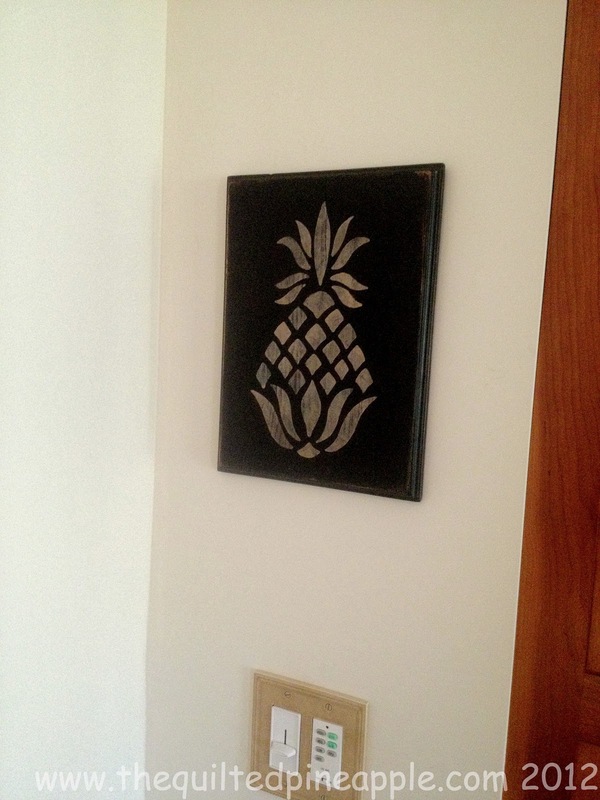 Above is a new pineapple sign. Mary of The Gettysburg Mercantile did a beautiful job. Mary makes and sells gorgeous primitive goods!!!! Very talented! Thank you for all the comments on Little Red! I hope some of you have also caught the mini bug!! WOW it really IS amazing!! 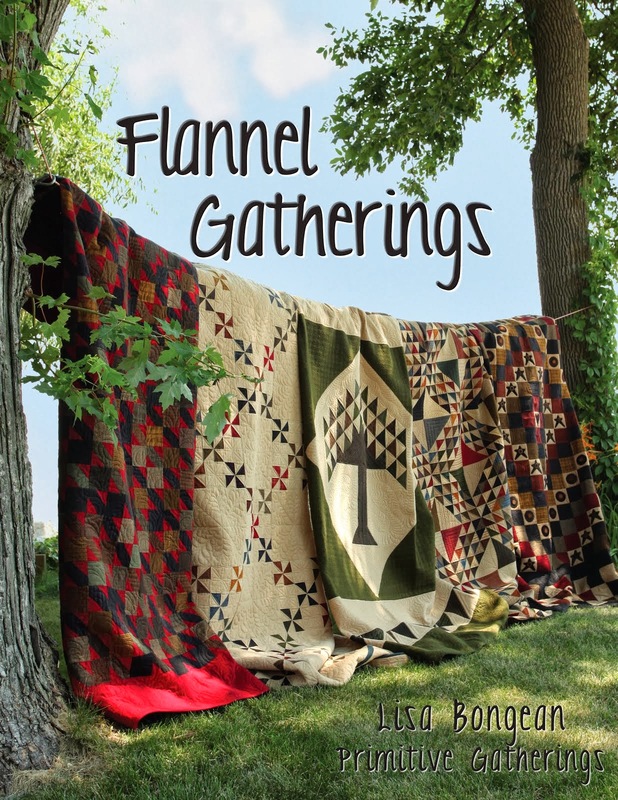 Your home and quilts are amazing!! Just wonderful! I did order that book you mentioned. 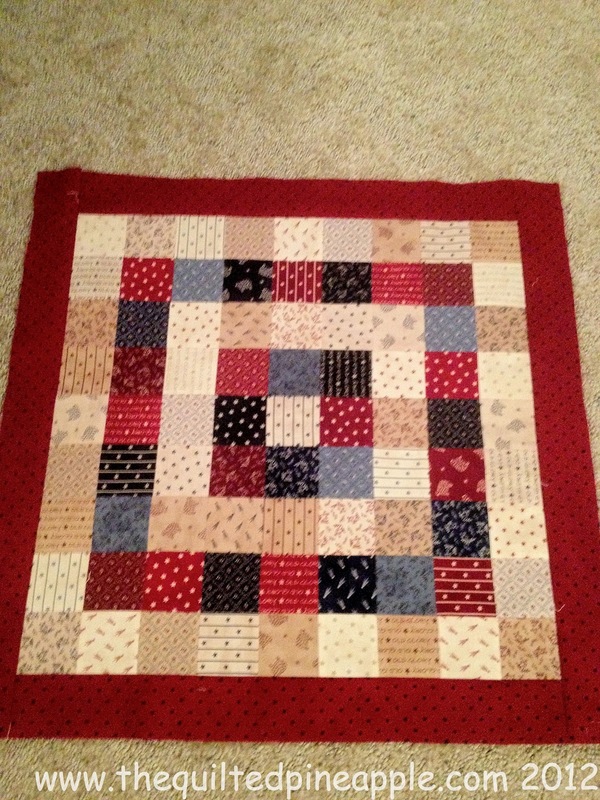 Love this little quilt too. 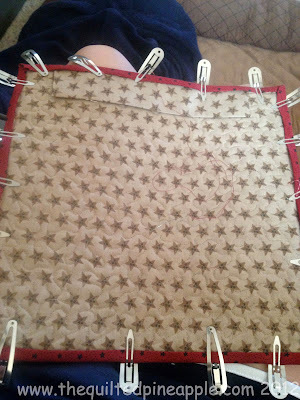 It is quite stunning both before and after quilting! Love that chair. Oldies, but goodies! Wow, what a beautiful little quilt and I cannot imagine all those little pieces. I love your decor and displays. Wow!! Kudos on such a terrific MINI. That is one super small twister project! You know I've caught the bug, Linda! The only cure for it is to keep sewing - lolol! This one is so adorable and I had no idea there was a mini pinwheel tool! The sheep is what caught my eye. 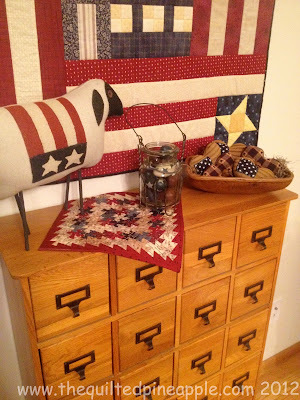 The quilt, the sheep, the cabinet, etc. 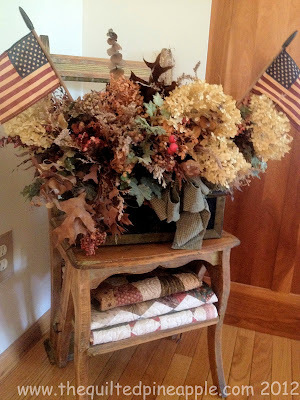 all go together well to make a great patriotic display. I'm so completely drooling right now! 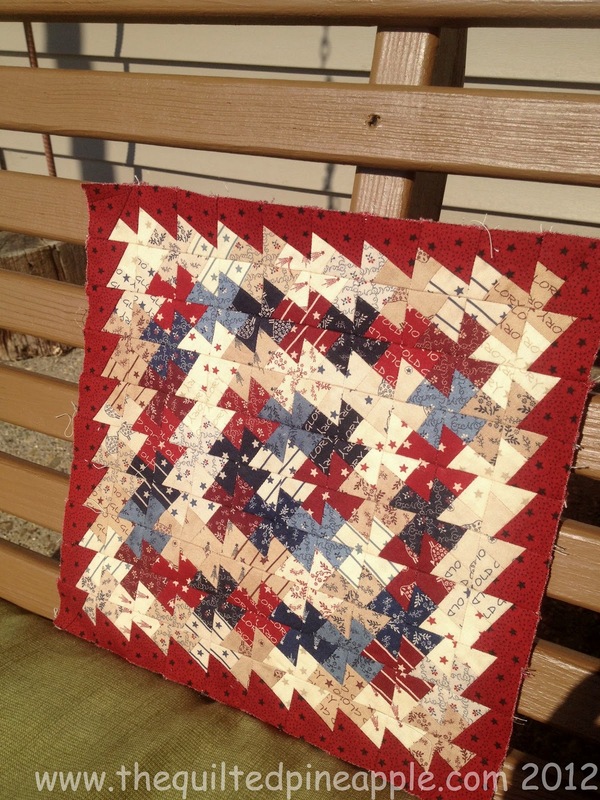 The quilt and the other patriotic stuff are gorgeous! Wow, so beautiful. I love this patriotic stuff. That is fabulous; I love it! 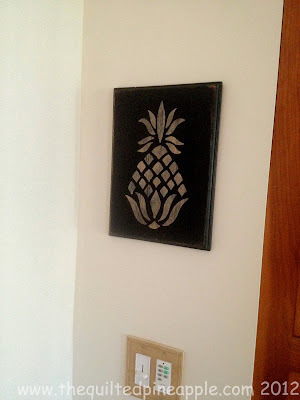 And the pineapple picture?? Love it!! I adore your little bitty quilts ;) I have always loved little quilts and have many of the Miniature Quilt magazines that were published years ago. I love looking at them. Now you have inspired me to make one soon! I bought the pattern and the tool, just have to give it a try! soon. Those twister rulers are fun. I have a big one and a small one. That is the cutest little twister. If you make two they'll be Twisted Sisters. :o) I love that library chair. What a special treasure. Oh, My! this little quilt is phenomenal. Love your red, white, and blue display too. I love your color way! Very cute!!! 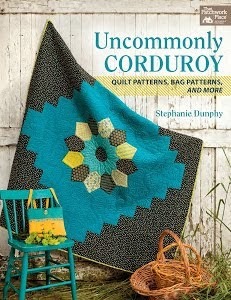 Aren't these pinwheel quilts addictive? I love it Linda. I've done one bigger, but that little one is just so cute. Love your photos! love your blog and style of decorating.could you tell me where you purchased the patriotic lamb. I want one.